into a traditional accordion design. PBM (Physical Behavior Modeling) enables true sound reproduction and dynamic expression. 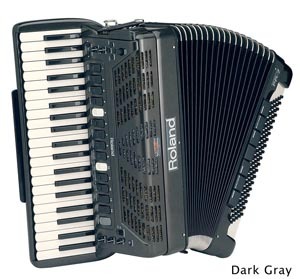 This technology uses complex algorithms (as opposed to sampled sounds) to accurately model an acoustic accordion's sound characteristics. The result is a recreation of the actual physical behavior and expressive nuances of an acoustic instrument. 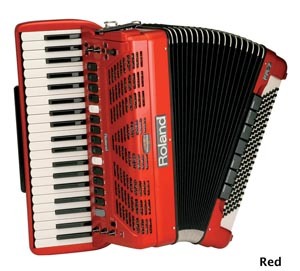 Realistic tone and expressive simulations of a wide range of traditional accordions. Traditional and orchestral sound combinations can be easily created and played back, complete with full bellows articulation and unique keyboard modes such as Solo, Dual and High/Low. Seven high quality bass sounds can be played separately by the left hand, including: Acoustic Bass, Bowed Bass, Fingered Bass, Picked Bass, Fretless Bass, Bariton Tuba, Bariton Tuba + E.Bass. 22 onboard Orchestral sounds and 7 Orchestral Bass sounds that can be mixed together with traditional accordion sounds. Portable, lightweight and expandable via MIDI.